I am southern. I was born and resided the longest in North Carolina but I do not like many southern things. I hate cornbread, won’t even look at a black eyed pea, rarely fry chicken and would prefer to never see gravy on anything. But the one southern thing I can’t resist is a biscuit. 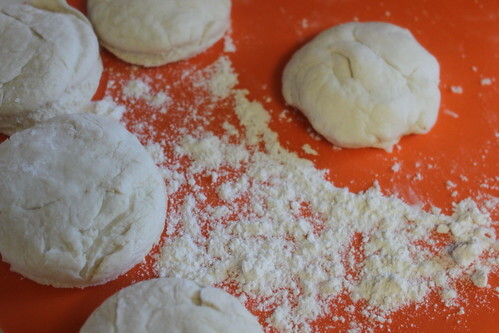 My mother made them almost every weekend and it was the thing we waited for every Sunday morning. Now I could make a traditional biscuit from scratch but why would I do that when there is Bisquick?! The most perfect food product made on the face of the earth. You can even make the Red Lobster cheddar garlic biscuits with Bisquick! I prefer a biscuit sandwich, I pile my eggs and meat onto a buttered biscuit and enjoy. My husband wants to eat each piece individually and spread all kinds of jelly and jam on them but I just want a biscuit sandwich. I think it’s because it reminds me of the biscuits we used to get on car trips from Biscuitville (Yes, there is a place called Biscuitville and it is glorious. The best one is the chicken biscuit with butter). Growing up my father could tell which child buttered the biscuits by how small a pat of butter there was. I always did the smallest and was always asked to NOT butter the biscuits. 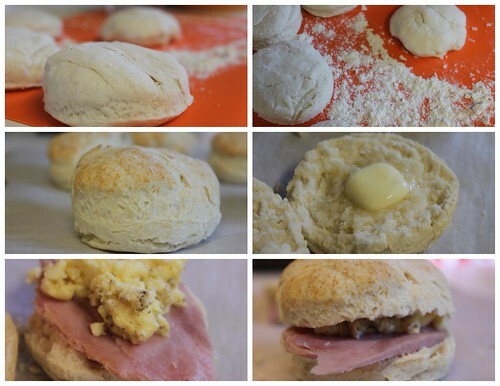 As I grown up, I’ve realized how crucial that pat of butter is to a biscuit, it really can make it or break it. I’ve also realized how much those family breakfasts made a positive impact on my life and gave me such great memories. No wonder I keep that up with my husband. 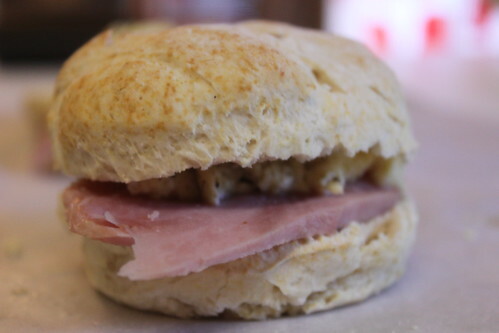 So this weekend I made my favorite breakfast, a ham and egg biscuit. And all was right in my world. Yum.